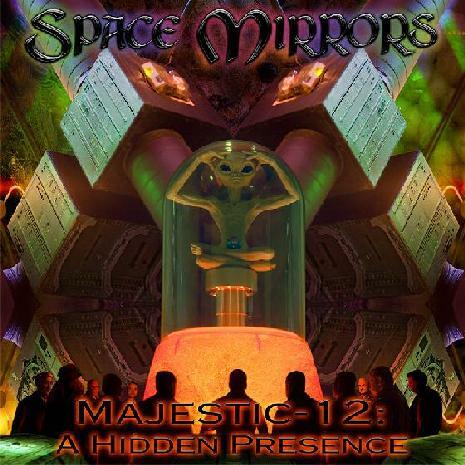 Space Mirrors has always had healthy doses of Metal in its Space Rock, but on their third album - Majestic - 12: A Hidden Presence - the Metal comes very heavily to the forefront, without completely forsaking the Space, and adding varied other influences into the mix. The album opens with "Tunguska", a fiery glom of Metal, Progressive and Space Rock stylings, with dual vocals by Alisa and Amber, and Nik Turner on sax. LOTS happening here and I'm not sure how Alisa makes the multiple elements work, but she does. Heavy guitars, full blown symphonic keyboards, colored nicely by alien electronics. And while we're deep into Metal territory, the lyrics and album theme are fully Space Rock, telling of a fireball appearing across the sky - Comet? Alien Ship? Wrath of the Gods? Pondering that question we see from the title of the next track, "Roswell 47", where this story is going. And with Martyr Lucifer's (Hortus Animae) demonic growling vocals and Michael Blackman's crunchy guitar the music is getting even heavier. But the music refuses to be pigeonholed to any simple genre characterization. The keyboards start with a Gothic flavor and then back to Prog, and finally a sequenced spacey feel. On "Dreamland I: Timewarp", we're treated to a wild brand of Space-Metal. The electronic percussion is like a machine gun, with Michael Blackman and Alisa cranking out a variety of guitar and keyboard sounds, and Lucifer is positively manic in his vocal delivery. "Dreamland II: Area 51" is still rocking but one of the more peaceful songs, with flowing keys, soaring leads by Cyndee Lee Rule's Viper violin, flute by Nik, and vocals by Amber. Definitely has a Hawkwind feel. Other standout tracks include "MJ-12", with its funky rhythms, freaky Forbidden Planet electronics, Nik's sax in jazz jam mode, nightmarish vocals by Lucifer…. my head is spinning! "Liars" features an interesting mixture of Death Metal, Funk, Prog and Space Rock bits. I love the combination of searing Metal guitar and Cyndee Lee Rule's violin on "Belgian Wave" and "Neuschwabenland (Flying Discs in Antarctica)". Michael Blackman rips off some nice guitar leads on the former, followed by a bit of sax jamming from Nik, plus a huge glom of spaced out freakiness. Cyndee really shines on "Cydonia: Face on Mars", sharing center stage with Blackman's guitar. "Krill Report" consists of Nik reading text from the Krill Report (see www.ufocasebook.com), plus funky dancey electro rhythms, bubbling mind massage electronics and wailing sax. "New World Order" is the closing track and one of the most different on the album. It's got Metal guitar chords played at a punky rock 'n roll pace, a whimsical New Wavey keyboard melody, and Martyr Lucifer in full satanic growl. In summary, this is, in my opinion, THE best Space Mirrors album yet. It's difficult to classify. It's stylistically all over the place, yet I'm blown away by how skillfully it's all put together. Martyr Lucifer's vocal delivery is incredible and I like the description in the credits of him on "lead clean, screaming and growling vocals". It can be unnerving to hear several tracks with him and then all of a sudden a track with Amber on vocals. I love the contrast. But yes, the conglomeration of styles, and the way it all just seems to work well together is really astounding. You've got all this Metal/Space/Progressive stuff happening all at once, and then Nik will come in with a jazz jam. It's all over the place... but it really works... it gels nicely. This album will appeal to a widely varied audience. Wanting to dig deeper I conducted the following email interview with Alisa Coral. Aural Innovations (AI): The variety of Metal, Space Rock and Progressive styles on this album took me by surprise. You did an incredible job of bringing it all together in ways that make this quite different to my ears, not just for Space Mirrors but in general. Was this intentional? Alisa: Yes and no. When I just began to work on this concept in 2005 I thought that this album would be more electronic than other Space Mirrors records. But when I started to compose the music, and it was in 2006, it went very much into a Metal direction. I decided that these elements suit the concept and my vision of the album much more. For me it's almost always: a concept first, then music and then lyrics. So after I explored the concept enough I begin to think about the music, to compose the first bass riffs and harmony lines and at this stage I decide which elements will be in the music. And it was quite obvious for me from the very beginning that I wanted to have a mix of very extreme metal, space rock and art rock sounds. I actually lined-up all the musicians whom I'd like to hear on the record very early and I'm very happy that it worked out really well. It was a challenge to bring all the elements together in a way to sound different from other albums, not just ours but also from other bands. The great inspiration for this album was, of course, as usual, Ayreon, but also the bands Sigh and Arcturus, which use lots of synth and spacey elements in their music based on black metal roots. It's a natural development for Space Mirrors to incorporate all these styles in our music. We always had metal songs on our previous albums, so it's not new for our fans. And actually I began to listen to Metal music at the same time as I started listening to Space Rock. So for me it never was a very new idea to combine it all together, just an evolution. AI: You've got contributions from participants in the US, UK, Australia, Italy, you're in Russia. How do you organize it all??? Alisa: First of all you have to be very patient. To work in such a way you need to have all the patience in the world. You should prepare yourself for a very long journey with your musicians from other countries. Sometimes you will have to wait for many months to get it done. And you should have a very clear picture of what you want and a very good basic recording with instructions for musicians. Of course it became possible mostly in the internet era when you can just send an e-mail to contact a musician and then converse over the web about what to do or even to send and receive demo-files to control the work. When I began all this with Space Mirrors back in 2002 it was still something very new and I think I was one of the first to try such kind of work over the internet and regular mail. I was certainly the first one in Russia. Now its become a rather usual way of recording for many bands. It's not easy when you can't hear your singer or other musician recording in the studio, when you can only rely on the professionalism and understanding of your music and your instructions. But in my case it never fails! I always choose very carefully with whom to work and they never disappoint. Some of them may be not very famous but they are all true professionals in what they do and they put all the passion in the recording. Yes, passion is the key I think. They can't be just some session guest musicians; they really should get into your music. Maybe it's also some sort of telepathy? I hope that maybe this line-up will stay for another couple of Space Mirrors albums! By the way, not all the musicians record on our albums distantly. For example I record Amber's vocals here in my studio. AI: Michael Blackman has been the one continuous participant on all the albums. It's great hearing his guitar work on the Space Mirrors albums because as a fan of his Alien Dream albums I get to hear a different side of him as a musician. Alisa: Michael is a permanent member of the band. He is the main and right now the only guitarist in Space Mirrors. He also records some bass guitar. Without him it would be very difficult to record these Space Mirrors albums. He is really a great guitar player. He can do all the very different things and is very creative. Usually I have very thorough instructions and comments on what to play. There are bass and melodic lines already but he always has his own very cool ideas, he can always add something interesting to the music and sound. And he wrote two excellent songs for this album. And I think "Dreamland II: Area 51" is one of his best songs ever! It took me some time to write lyrics for it but at the end it's great. I really like this track, very powerful! I think Michael is one the best guitar players on the scene and he can really feel what guitar I need in the music. With him we work very close on the songs, exchanging lots of files over the internet, almost in real time. It's actually almost like having a jam together in the same room. So the distance is not a problem when you work with someone like Michael Blackman. AI: I really like Martyr Lucifer's vocals. I normally don't like the growling death metal vocal style, but he's got a very distinct voice and style of delivery. Alisa: I needed a male singer for this album and from the very beginning I decided that I need different kinds of vocals, including growling. So I was looking for two or maybe even three singers. But then I heard the Hortus Animae album "The Blow of Furious Winds…" and thought "yes, that's the singer I want!" He was doing all kinds of vocals: clean, growling and screaming. Luckily this band was signed to the same record label as we and I had no problem with contacting Martyr Lucifer. So he agreed to take part and it began from there. It was a real pleasure to work with Martyr. It took some time but when the vocals were recorded I was very happy with the result. He was the perfect choice so I didn't need other male singers for the album! He did everything! He has his own distinctive style and manner. He is a technical singer but he is very emotional in his singing. There are lots of very known technical singers who can do many things with their voices out there but most of them have no style, no emotions at all. And Martyr can really get into the song. He really made all the right accents where they should be. It was a top job! He is also a part of a band Opposite Sides, from Italy too, they are really good extreme metal with some industrial influences. AI: Nik Turner makes some great sax and flute contributions. And he was a perfect choice for the narration on "Krill Report". Alisa: Nik was the first musician whom I asked to participate in this album. And it was a great inspiration for me when he agreed! He is very important for the album because there are some parts which I specially wrote for the saxophone and flute. And Nik didn't disappoint! He is a true professional. When I contacted him he said that I'd have to wait for several months. I said "ok, no problem". And after some waiting he recorded all the tracks. They were done very professionally and he recorded several versions for each track so it was a lot to choose from! He really took this very seriously and I really like the result! I think that maybe this is one of the best Nik's performances ever on the records. And of course the narration, yes, I even didn't think that someone else could do that. It was for Nik from the very beginning, he's got a great narrating style, you know… and what a voice! Nik is a legend and I really hope to work with him some time in the future. He is surely a true spirit of the Free Festivals Space Rock. He is a great talent, a wonderful and creative musician. It is an honour to have him on this record! By the way I really liked his Space Ritual album "Otherworld". AI: Cyndee Lee Rule has been adding her Viper violin to a lot of people's music lately. It really adds a beautiful coloring to the sound. Alisa: Yes, her violin was essential for the sound of some songs. Again I decided about having a violin on the album from the very beginning. And we were conversing with Cyndee through myspace. She liked my music and I liked her playing so I invited her to record. She can do all the styles from aggressive distorted violin to very melodic and she does them all on the album! Cyndee is one of those musicians with whom it's really easy to work. She is very fast with recording and of course she really feels the music. It was very cool that she liked our music and agreed to play. And I actually think that this is a bit different from the music she usually records on. I certainly want her wonderful violin sound to remain on the future Space Mirrors albums! She is a very good friend and I like to talk with her. It was very cool to meet finally at the Gong Unconvention in 2006 and there we talked a lot about music, life, politics and we have found very much in common. AI: Despite the dominance of the Metal influences, the UFO theme of the album is pure Space Rock. Tell me more about the theme of the album. Alisa: Well, I think it's just a cliché. There are many metal bands which use the UFO theme in their albums, for example Hypocrisy, Pain, Running Wild… I thought that mix of metal and space rock will perfectly fit the concept. The album is basically about the twelve events and landmarks of the UFO history. From Tunguska with all the mystery around it to Roswell, Area-51, the MJ-12 conspiracy, Nazi UFO bases in Antarctica and New World Order. The album is called "Majectic-12" and it has different meanings. One of them is a group of people who in general were behind the whole UFO conspiracy since Roswell 47. Kevin Sommers did an excellent cover art for the album and it reflects the ideas very well! He also created a great booklet design with pics which open the meaning of every song. Kevin is a great and a very creative artist! AI: You draw heavily from the www.ufocasebook.com web site and the researcher/webmaster wrote a forward in the album liner notes. I spent some time looking it over and this is an incredible site. LOTS of information. What do you think about all these reports of UFO sightings? Abductions? Government conspiracy? Alisa: Yes, that site was very helpful when I was digging for different facts for the concept of the album. There is a lot of crap and fakes around the internet and in the press, and without such a site like www.ufocasebook.com you can really get lost. Why I like this site is because they just represent the facts to you and then it's your own decision to believe it or not. I've read lots of articles and stories, saw lots of photos. And I think some of them are really genuine! You know, UFO does not actually mean "alien ship". It can mean anything "unidentified", and I think there are really unidentified objects out there. We have the right to know what are they, we should explore and investigate the phenomenon. But for some reason the governments are against it and they create conspiracies, the false research projects to hide something. They try to fake the evidence. The Roswell case is one the most well documented and earliest. If they have nothing to hide then why to do that? What is it they don't want us to know? These are the questions we ask. I never draw any conclusions without facts. But the fact is that they don't want anyone to really investigate the cases. Maybe these are some secret military tests? That could be the reason. There are some very weird abduction cases. In some of them all sounds very logical and you can't find weak points in what people tell. You can believe it or not but something strange is happening, that's for sure. Anyway, if there is nothing to hide the governments wouldn't worry about the researchers. AI: This is the second album you've done with the Sleaszy Rider label so I assume that's worked out well? Has distribution been good? I've received questions from people here in the US asking where it will be available. Alisa: Yes, it was much better than before. And we have a contract for this album too so there was no search for another record label. And other labels really couldn't offer anything better so far! Some people were a bit surprised to see us on a metal record label. Well, now they know why we are here (laughs). Honestly I think that from all indie labels the metal ones have the best distribution. And Tolis Palantzas, the owner of Sleaszy Rider Records, is working really hard to get the best. He's already got very good distribution in Europe. You can buy our albums in such big online shop chains as Amazon. And he works on US distribution. So far we have only some mailorders there but I'm sure there will be more. And by the way, if the fans write to the shops (online or not) where they buy cds about Space Mirrors album maybe the shops will order it from Sleaszy Rider! It's not an easy situation in the music industry now and indie music stays alive really only because of such music enthusiasts like Tolis and fans who buy the cds. His support was very vital during the "Memories…" days. AI: I was very impressed with the Vespero and Kalutaliksuak albums that came out on the RAIG label last year. What was your involvement in those albums? Are those bands local to you? Alisa: I know Igor Gorely who is the RAIG owner and he is a very good friend. He asked me to make the mastering for these two albums and so I did. With Kalutaliksuak it was a lot of remastering work. I really like the music on these albums. Vespero recorded a very interesting album in the direction of instrumental Gong and Steve Hillage but still with their own style. Vespero is not local to me, they are from another town, far from me. And Kalutaliksuak are from Moscow, so yes, local. AI: Have there been any other musical activities you've been involved in recently other than Space Mirrors? Alisa: I did mastering for the Jet Jaguar and Guild Navigators split which should be released later this year, recorded vocals and synths for the new Jet Jaguar song and also did mixing/mastering for Rushus Project (a Russian band). AI: I get quite a lot of music submissions from Russian bands and individuals. Do you network locally with many artists? Alisa: Not much really. It happens so that I have much more common ground with musicians from other countries; actually I know personally much more of them than Russian ones. It doesn't mean that I'm not open to co-operation with Russian artists; it just wasn't satisfactory so far. Most of the Russian indie musicians I know are through RAIG record label or some metal ones. Sometimes I get contacted by Russian musicians. Space Mirrors is rather known here in certain music circles despite almost zero press coverage in Russia. But Russian music journalists are another topic. AI: Any live performances in your area of space/psych/progressive/electronic music? Alisa: Not sure about progressive, I don't listen to it much. From what I know Disen Gage play some really cool concerts. There is actually no Space Rock scene at all. There are some bands like Vespero or Kalutaliksuak which are close to what we can call Space Rock but I don't know any other. There are some free psychedelia bands as far as I know but I never heard about any band in a Hawkwind-like Space Rock style. And that's what I'm more into. It would be cool if the Russian indie scene and market developed more but it doesn't look good at the moment and I don't see how (HW-ish) Space Rock can find a niche here. It seems like there is some demand for the so-called Post Rock bands which is a good sign but I don't know many of them. AI: Any other news or upcoming events we should know about? Alisa: I have plans for two albums right now. They will be quite different from each other. But I think it will be very interesting to record them. With some interesting guests. Also there are plans still to make a live band someday. If "Majestic-12" does well maybe we will be able to get some financial backing for a small tour and support from a record label. Actually, for example, I know musicians with whom we could make concerts in the USA. So musicians are not a problem. Money is a problem, as usual. But I hope it will be solved at some stage. And then see ya on the road! Hear music at the Space Mirrors Myspace site: http://www.myspace.com/spacemirrors.